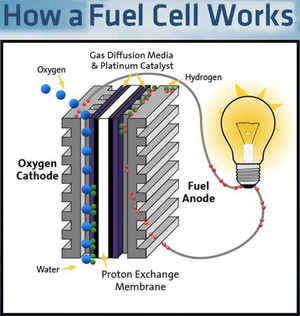 A fuel cell is an electrochemical conversion device. It produces electricity from various external quantities of fuel (on the anode side) and an oxidant (on the cathode side). These react in the presence of an electrolyte. Generally, the reactants flow in and reaction products flow out while the electrolyte remains in the cell. Fuel cells can operate virtually continuously as long as the necessary flows are maintained. Fuel cells are different from batteries in that they consume reactant, which must be replenished, whereas batteries store electrical energy chemically in a closed system. Additionally, while the electrodes within a battery react and change as a battery is charged or discharged, a fuel cell’s electrodes are catalytic and relatively stable. When building we are committed to using salvaged / re-purposed building materials whenever possible. In winter 07/08 season we built a new base for our dogsledding tours using shipping containers. Building with used shipping containers is the new eco-friendly thing to do. 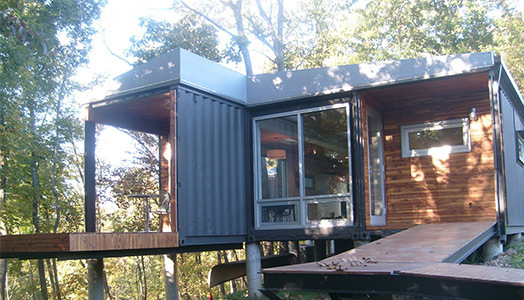 few ideas can compete with the weird, pragmatic beauty of the used shipping container. Cheap, strong and easily transportable by truck, train or boat these big steel structures now litter the ports of America as mementos of our trade imbalance. (Many more full containers arrive on our shores than depart, so ports either ship them back empty — to the tune of about $900 per — or sell them.) Hurricane proof, flood proof, fire proof, these metal Lego blocks are tough enough to be stacked 12-high empty — and thus can be used in smaller multistory buildings. Used containers (which can be picked up for $1,500 to $2,000) often have teak floors and sometimes are insulated. The bright orange, blue and rust corrugated boxes may not appeal to everyone. But contemporary hipsters find them not just the ultimate in postmodern appropriation but aesthetically pleasing as well.And even though containers have little of the crunchy nostalgia of the hay-bale house or the yurt, they trump most other forms of green building because, in the current economy, they are virtually a waste product. Making a building (which can last and last) out of what is essentially a huge piece of industrial detritus takes recycling to a new level.The concept of using shipping containers as buildings is hardly new — institutions like the military have been using the structures as temporary offices, bunk houses and showers for some time. Examples of designers incorporating shipping containers into residential designs date back to 1982. Our new 4-stroke snowmobiles are quieter and cleaner without compromising speed. 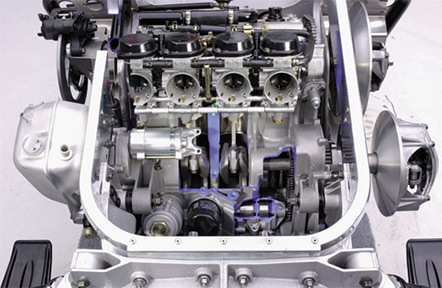 Old-fashioned 2-stroke machines generate a considerable amount of both noise and pollution and spew out blue clouds of unburned hydrocarbons. The industry’s argument against 4-strokes has always been that the equivalent 2-stroke engine weighs less and produces more power. Yamaha engineers have neatly torpedoed that theory, our new RX-1 snowmobiles are powered by a 4-stroke, 998cc, 4-cylinder, DOHC, 5-valves-per-cylinder, liquid-cooled Genesis Extreme engine, and it uses four Mikuni BSR37 carburetors for a peak of 145 hp at 8300 rpm. Allowing us to operate Whistler’s cleanest snowmobile fleet. In 2005 Canadian Snowmobile committed to using recycled paper for all it’s content, business cards, stationery and advertising materials. We made this commitment because paper and paper products make up the largest percentage by volume of global solid waste streams. However, 2003/04 paper and card accounted for almost a third of all household waste collected for recycling, this means, however, that there is still a considerable amount that isn’t recycled and is largely going to landfill or incineration. Being a company that operates in a beautiful coastal rain-forest we feel our responsibility is mandatory to preserve the incredible environment we are surrounded by. This is our commitment to help reduce our footprint. Our printing is done on 100% post-consumer recycled paper.